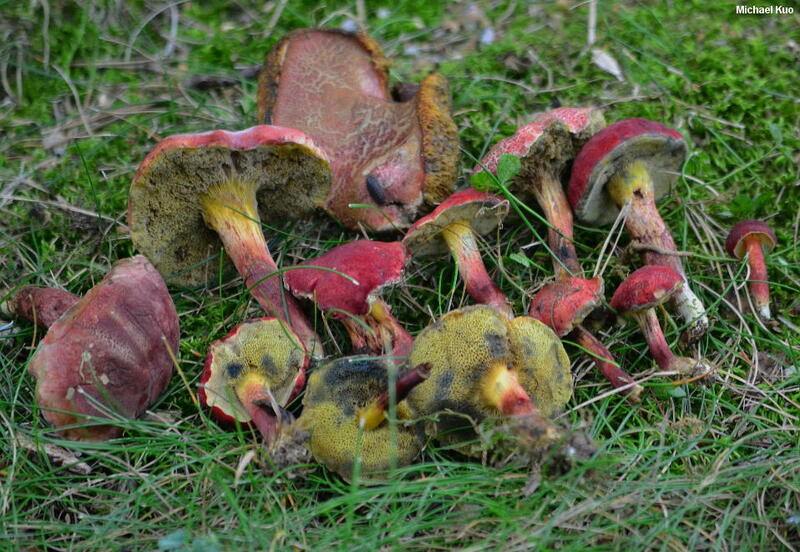 Confusion over what, exactly, constitutes Xerocomellus rubellus (formerly known as Boletus rubellus and Xerocomus rubellus) has reigned in bolete literature for over a century; it is one of several confusing, small species with red caps and blue-bruising pore surfaces. 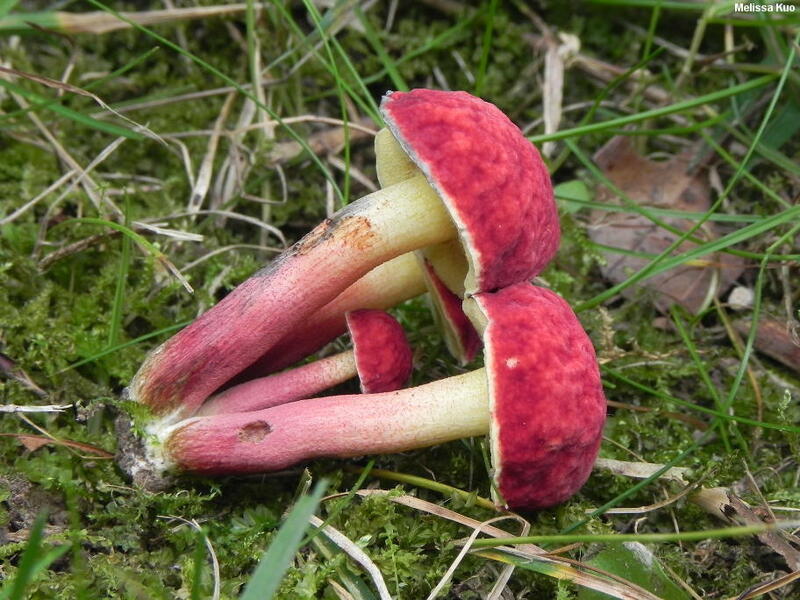 However, recent European sources, informed by contemporary studies, have begun to clarify the concept for this species, which I suspect is rare in North America and possibly limited to locations where European trees, the mycorrhizal partners of the mushrooms, have been planted as ornamentals. Xerocomellus rubellus is one of a few Xerocomellus species featuring tiny bright red to carrot orange dots in the flesh at the base of the stem. 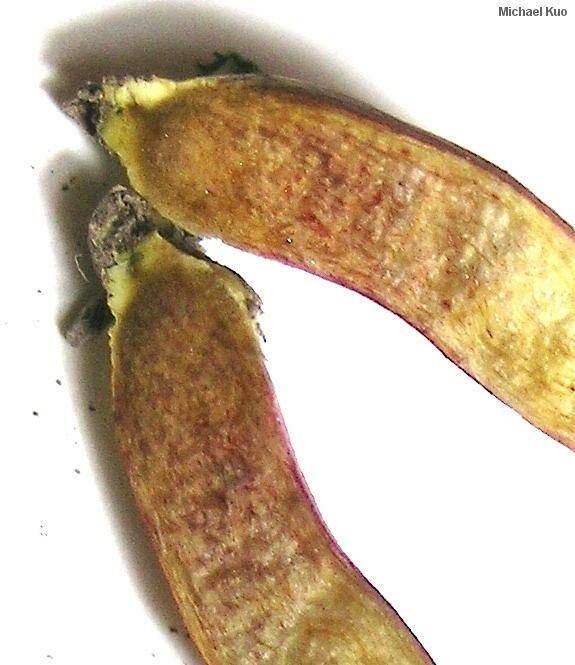 A hand lens may be needed to assess this feature confidently, along with fresh specimens in which the flesh at the stem base has not begun to deteriorate and discolor. 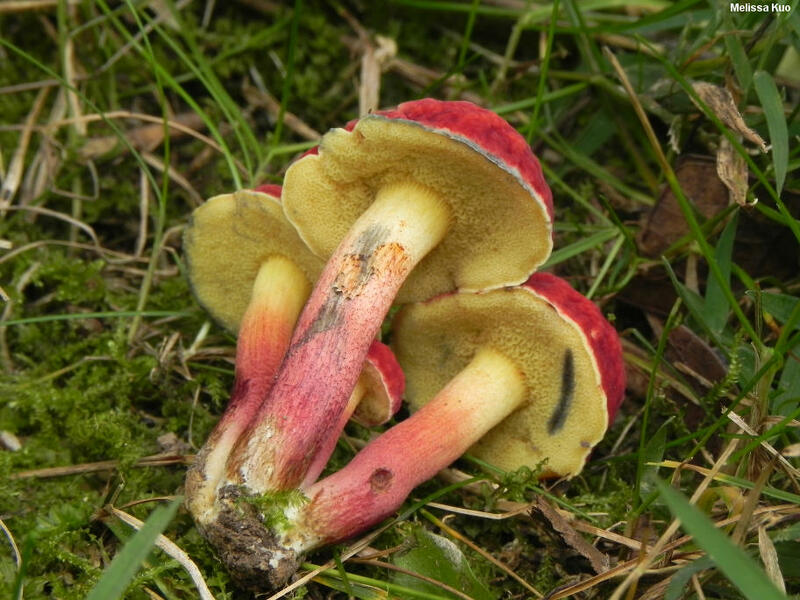 In Europe, only Xerocomellus communis also features the red dots, and its cap is brown and therefore not likely to be confused with any but old, discolored specimens of Xerocomellus rubellus. In North America, it is unclear how many other species share the red dots in the stem base, since North American mycologists have paid no attention at all to this feature. Among my collections of rubellus-like boletes, only Boletus campestris joins Xerocomellus rubellus in having the dots; it can be separated tentatively by its duller colors and the lack of red points on the surface of the stem--and definitively separated with a microscope by virtue of its very different pileipellis. 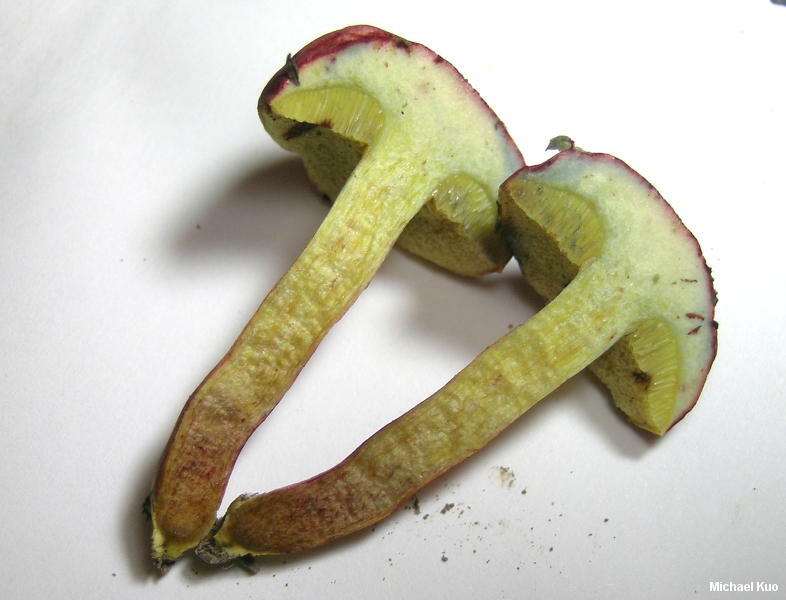 Boletus rubellus and Xerocomus rubellus are synonyms. Ecology: Mycorrhizal with hardwoods (especially oaks); growing alone, scattered, or gregariously, in woods or, frequently, at their edges, in parks and gardens; summer and fall; North American distribution uncertain (see above). The illustrated and described collection was made in a botanical park in Illinois. Cap: 2.5-5 cm; convex, becoming broadly convex or nearly flat in age; dry; bald or, when young, very finely velvety; bright, dark pinkish red, fading to pinkish red or pinkish; becoming finely cracked in maturity. Pore Surface: Becoming depressed at the stem; yellow at first, becoming dull olive yellow; bruising promptly blue; 1-3 angular pores per mm; tubes to 7 mm deep. Stem: 3-7 cm long; 4-10 mm thick; tapered to base and sometimes flared at the apex; yellow to bright yellow at apex, pinkish to red below; usually punctate with red points and dots, at least when fresh; not reticulate; basal mycelium pastel yellow when fresh, becoming ivory. 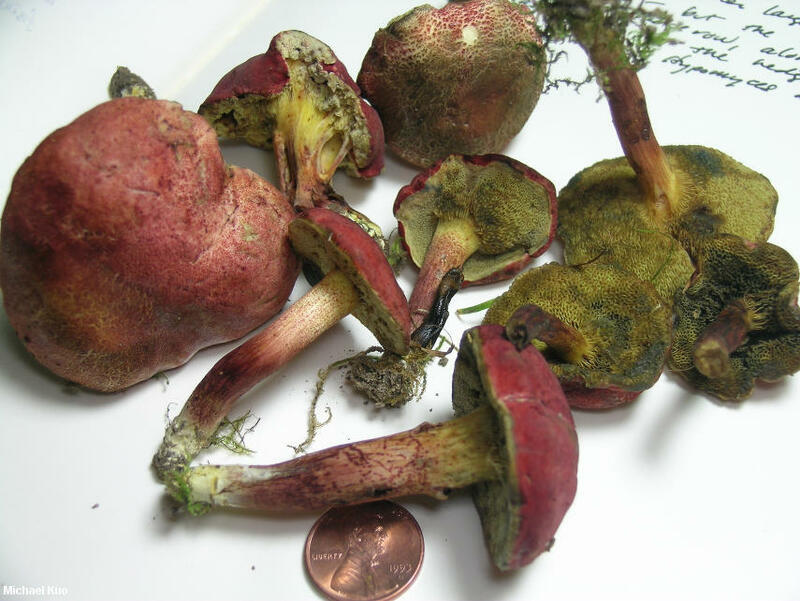 Flesh: Whitish in cap; yellow to red in stem; staining slowly and slightly blue when sliced; flesh in stem base with numerous tiny, bright red to carrot orange dots. Chemical Reactions: Ammonia negative on cap surface; negative on flesh. KOH dull orange on cap surface; dull orange on flesh. Iron salts gray on cap surface; negative on flesh. 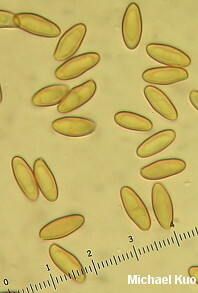 Microscopic Features: Spores 10-13 x 4-5 µ; subfusoid; smooth; golden in KOH; dull brown in Melzer's. 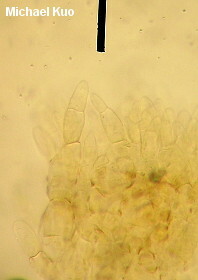 Hymenial cystidia more or less lageniform; to about 60 x 12.5 µ. Pileipellis a palisadoderm of septate, encrusted elements 10-15 µ wide; terminal cells obnapiform to subglobose; hyaline to faintly ochraceous in KOH; dull brown in Melzer's. REFERENCES: (Krombholz, 1836) Šutara, 2008. (Saccardo, 1888; Hills, 2008; Knudsen & Taylor, 2008.) Herb. Kuo 08311401.